Background: Cognition of surface roughness at the same time by the two senses (tactile and visual) is still undeclared, and how both effects on each other could be intriguing. The main factor for roughness estimation of fine surface (spatial features below 200 µm) is also unknown until present. 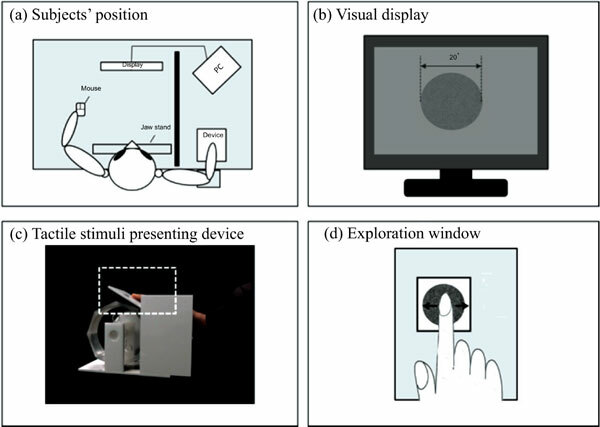 Methods: In unimodal task, subjects need to compare which stimulus perceived were rougher, visually and tactually, while multiple sensory of visual and tactile were mixed in bimodal task. We also varied the type of roughness in bimodal task into two categories to discover whether there is any acceleration or suppression by different stimuli. Results: We found that tactile sensory was dominant in the perception of roughness by fine surface. During cross modalities, visual information has almost no effects toward tactile sensory, but in the other hand tactile information had significance effects onto visual sensory. Furthermore, we found that stimuli with smaller particles bring more interference into subject's perception compared to bigger particles in fine surface. Conclusion: We suggest that particles sizes are as significant as the modalities in visual, tactile, or multisensory integration of both, in roughness perception of fine surface. Visuotactile, crossmodal, roughness, texture perception, fine surface texture, tactile-visual.